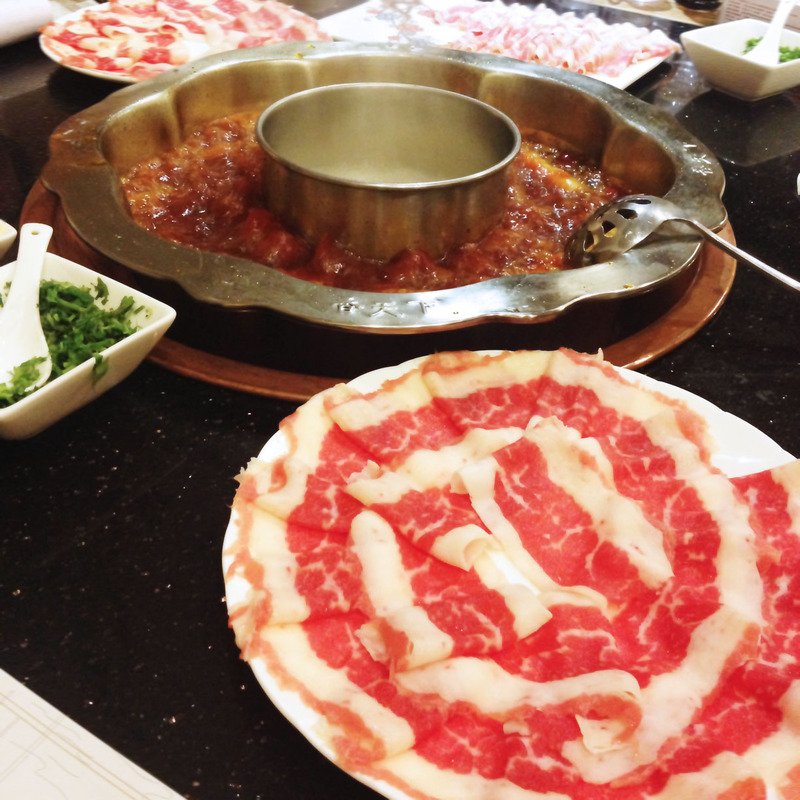 All my life I have thought that a Sichuan hotpot comprised a pot of boiling soup made of some animal stock and spiced with Sichuan peppers, and in that I would cook a variety of raw meats. And the sort of Sichuan hotpots I’ve had, I was able to drink the soup at the end of the meal, which by then was delightfully sweet with the essence of all the meats and vegetables I had cooked in it. But during my recent trip to Chengdu, I realised how wrong I had been. The real McCoy, as I had discovered in a hotpot specialty restaurant just behind InterContinental Century City Chengdu, uses a pot of boiling chilli oil. The eating process was a delight, as the oil was mind-blowingly, tongue-numbingly spicy and the Australian beef slices were fresh. But my body was just not used to ingesting so much oil in one sitting that I hurled up my entire dinner when I returned to my room that night. The last time I set foot in Chengdu was in May 2009, a year after the Great Sichuan Earthquake, a disaster that originated in Wenchuan County but killed almost 70,000 people beyond that epicentre. My trip then was to see how the Chinese province had recovered from nature’s wrath, and it took me mostly to areas beyond the provincial capital, such as Yibin and Zigong cities, and as far north as the amazing Jiuzhaigou nature park in the Aba Tibetan Qiang Autonomous Prefecture. My time in Chengdu was merely a night. This time round, I got to stay in Chengdu for five nights. Most of my time there was for work, but I managed to steal a couple of hours each on two days to see some sights. 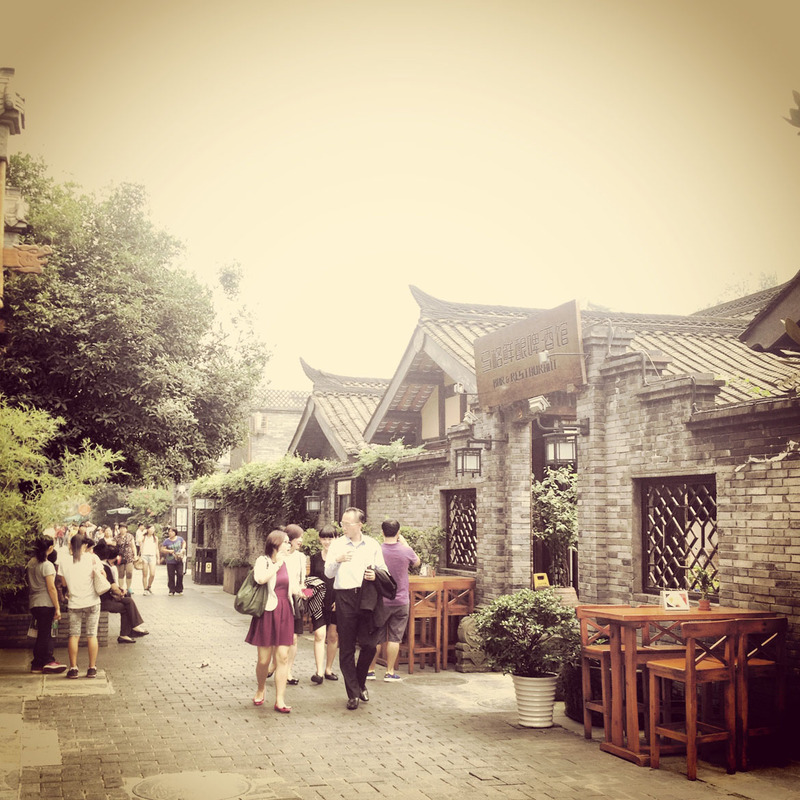 And I must say, I love Chengdu much more than I do the other Chinese cities I’ve been to. Of course, the brilliant InterContinental Century City Chengdu played a big part in shaping my pleasant impression of the Chinese city. Never underestimate the importance of the hotel experience in the bigger scheme of a trip. But Chengdu’s biggest charm, in my opinion, is its ability to retain its soul despite its rapid modernisation and infrastructure development. Its people – at least those whom I had met and interacted with, from the taxi driver to waiters to security guards at the convention centre – are patient, polite and genuinely friendly. I was surprised to hear the taxi drivers greeting toll booth staff with a chirpy “how are you?”. That never happened in Shanghai! Waiters go about their duties with a certain grace and a ready smile, no matter how busy lunch or dinner time was. The security guards at the convention centre were firm but polite, never raising their voices or pushing and grabbing at people. And that is vastly unlike their counterpart in Shanghai, Kunming and Hangzhou. God knows how many times I had been rudely manhandled by security guards at convention centres in those cities when I forgot to hang my delegate badge over my neck before entering the venue. 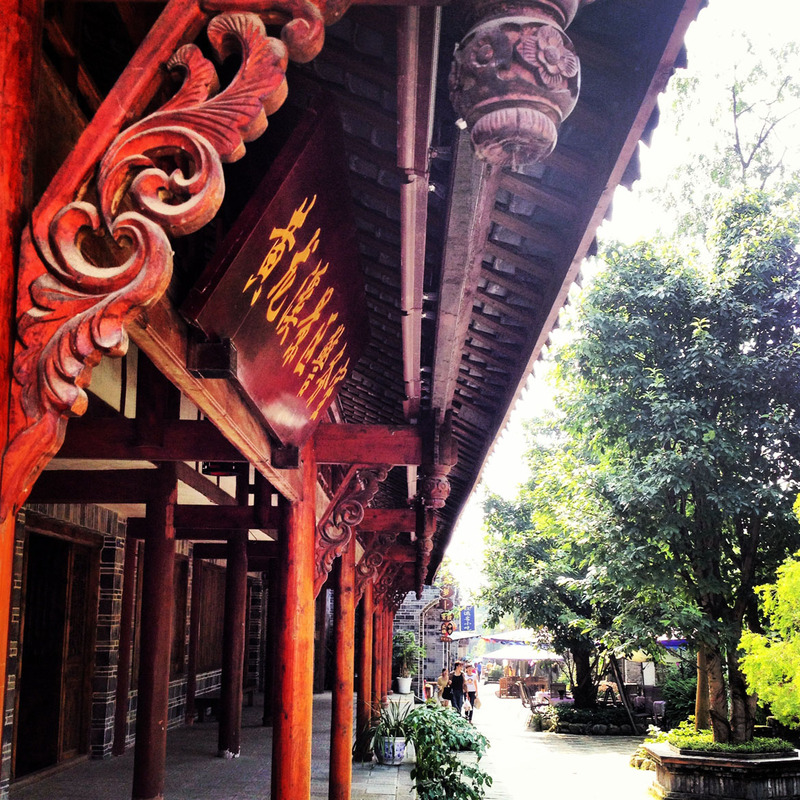 Then there was also a lot to love about the attractions in and around Chengdu, specifically the areas with preserved architecture. 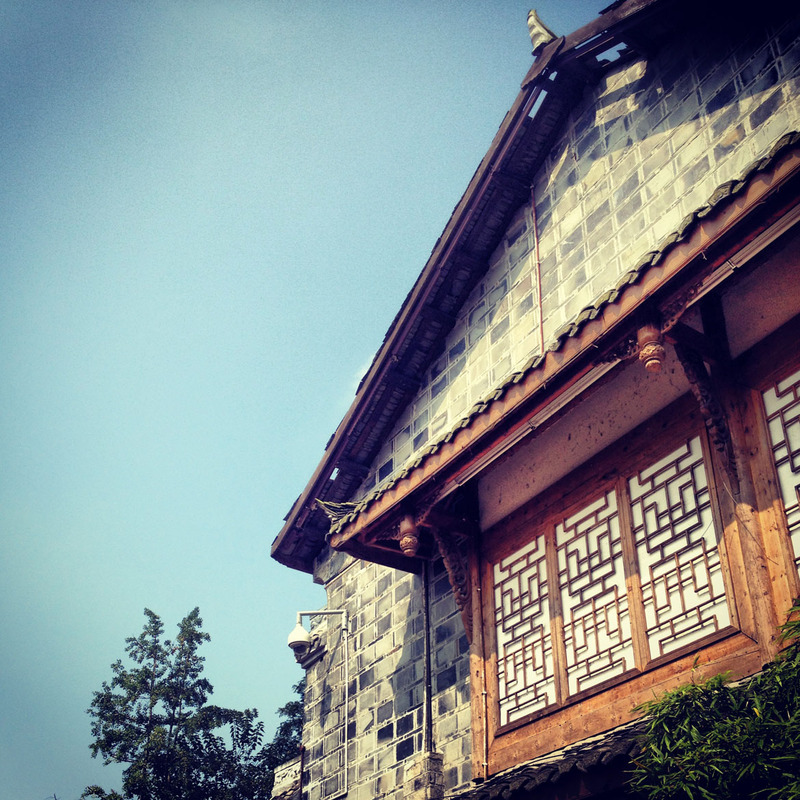 I called at Huanglongxi Ancient Town, a destination that dates back 1,700 years. It is located about 50 minutes by car, southeast of Chengdu. Much of the buildings and stone-paved streets here are preserved, although the lure tourism dollars had brought a tad too many gaudy souvenir shops to the area. Walking through this area on a quiet, weekday morning makes for a surreal experience. 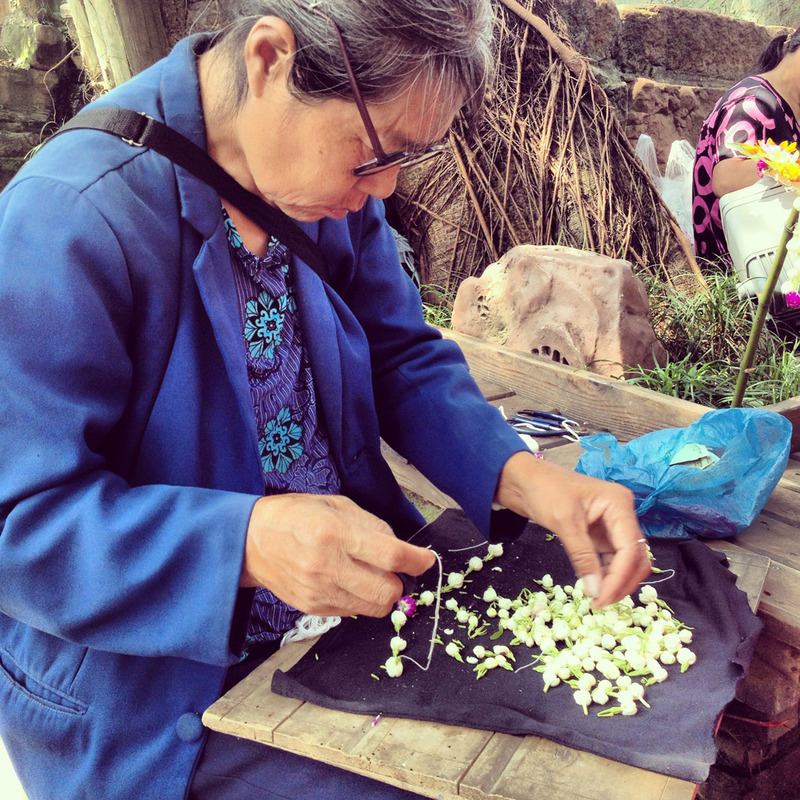 One could buy a headpiece made of large flowers and leaves to keep the sun out of one’s eyes or a delicate necklace of jasmine buds from the many grannies in the ancient town. And even if you did not buy something from these grannies, they would still flash you a toothless grin before tottering off to the next tourist. A narrow stream cuts through Huanglongxi Ancient Town, and several tea houses and snack shops line its banks. It was a blistering hot day when I was there, so I settled down at a shaded table for a bottle of ice-cold Kronenbourg 1664. Bliss! 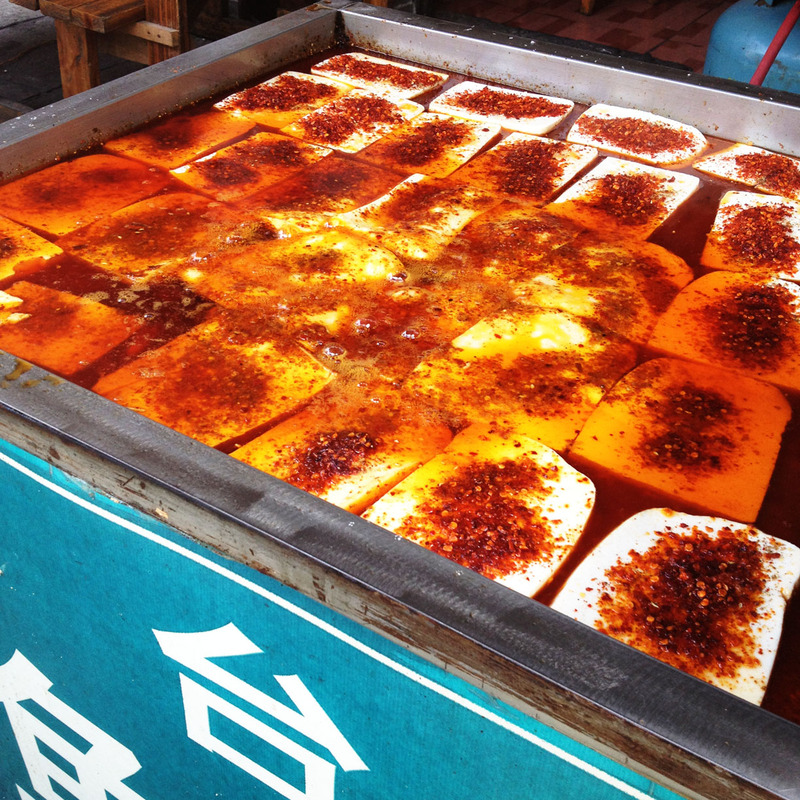 There are also many local snacks, such as sesame cakes and steamed fish tofu. The latter is cooked in a potent-looking broth of Sichuan spice and chilli oil, as you can see in the picture below. I love spice, but even that looked too explosive for me. If one was in comfortable walking shoes, and the weather was not too hot, one could probably spend half a day or more exploring Huanglongxi Ancient Town. But I was in a pair of Melissa Dreaming+Julie Petit, which was more suited for a spot of shopping in a mall, and my outfit was too thick for summer (the weatherman lied that the temperature in Chengdu would be around 15-23°C but it was around 30°C!). So after two hours, I was close to melt-down and had to return to my hotel for a cold shower and change of clothes. 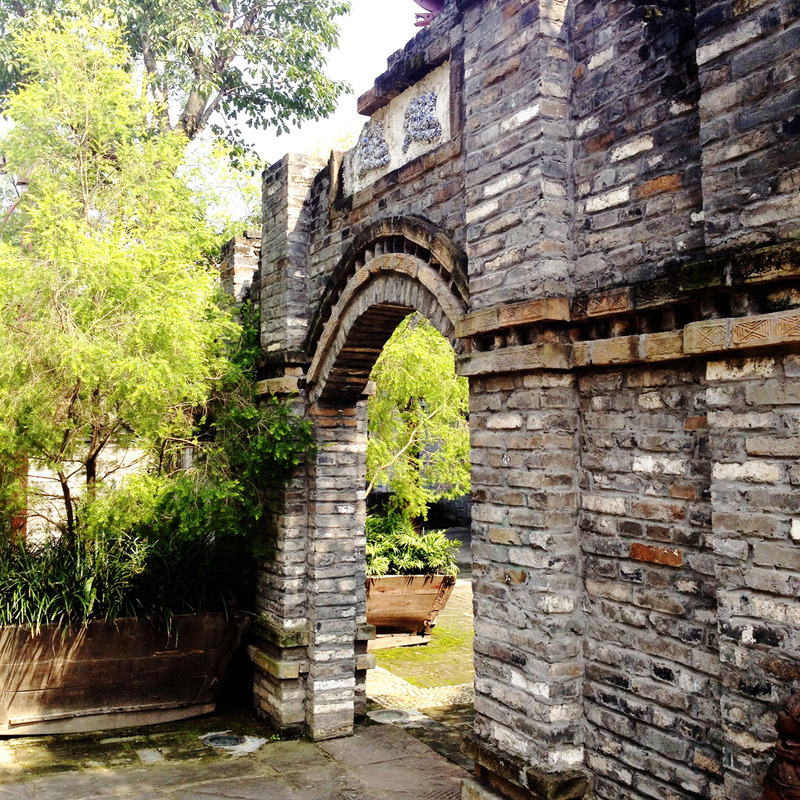 On another day, I visited Kuanzhai Alley, an area with a mix of broad (hence, kuan, which means broad in Mandarin) and narrow (zhai in Mandarin) alleyways that are lined with Ming and Qing Dynasty-style courtyards and grey stone buildings. These buildings now house quaint cafes, casual eateries favoured by locals, fancy restaurants favoured by tourists, art galleries and trinket shops. There are also one or two opera houses. Sichuan opera is said to be different from the usual Chinese opera, as it features different musical instruments and lots of stunts, such as fire spitting and rapid face-changing. My companions were not quite keen on Sichuan opera, so I missed the opportunity to see it for myself. Occasionally, one would chance upon a mobile stall that provided ear-digging services. The older folks seem to really love having their ears cleaned in public! I was told that Kuanzhai Alley truly comes alive after the sun sets, as that is when the beer bars and live music clubs open their doors. I will just have to determine if that was true on my next trip to Chengdu. Whenever I go on a trip, whether for business or leisure, I am probably most nervous right before I ‘discover’ my hotel, the place where I would be doing some of life’s greatest necessities – cleaning myself and sleeping – for several days in a row. You would think, why, surely I would have had some expectations of the hotel before I booked. Of course. But never completely trust a marketer who knows how to manipulate photos and make the product appears far better than it is in reality. What about user generated content sites, like TripAdvisor? Well, I’ve seen some poorly taken photos of hotels that I personally love, as well as beautiful photos of properties that turn out to be pretty bland in real life. In short, I can only trust my eyes. On my recent trip to the capital city of Sichuan, I had a delightful moment of truth when I stepped through the doors of InterContinental Century City Chengdu. Thank goodness! 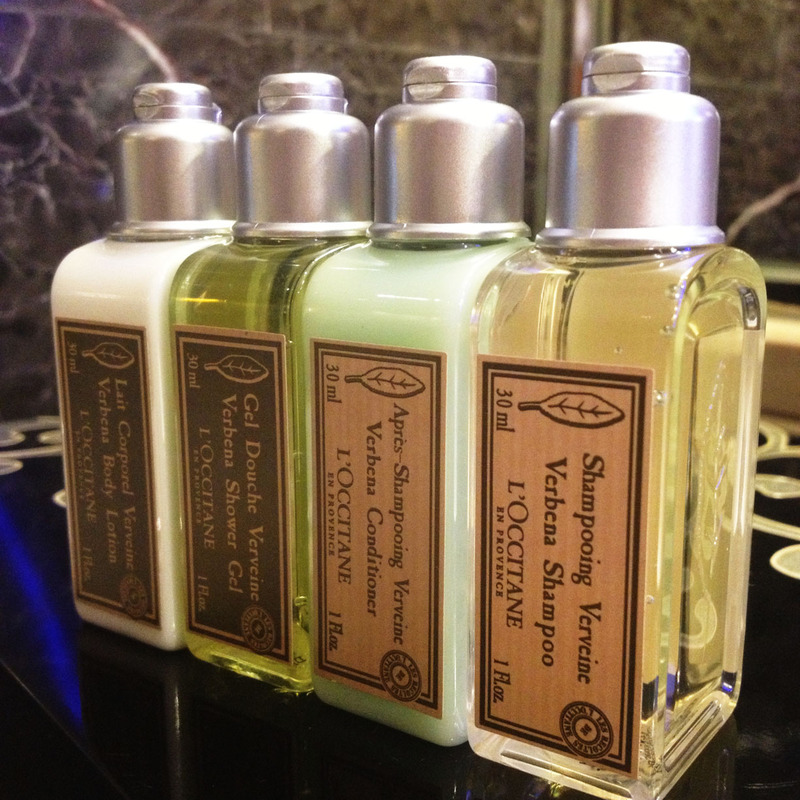 The fragrance of the hotel was the first to hit me, a light floral note that was most soothing. Then, it was the lobby. Coming from land scarce Singapore, space is a luxury and the hotel’s lobby is simply extravagant. Imagine this: an ‘ancient’ two-storey grey brick house, an architecture style of old China, is built into the lobby. One part of this structure functions as the check-in/check-out area, while the other forms part of a sprawling garden courtyard-style restaurant. Marketer’s shot, I know. But it is very close to the real thing indeed. If I had balls, they would have dropped to the floor in awe. Minutes later, I discovered that the software was just as good as the hardware. The staff at the check-in desk could speak almost perfect English. 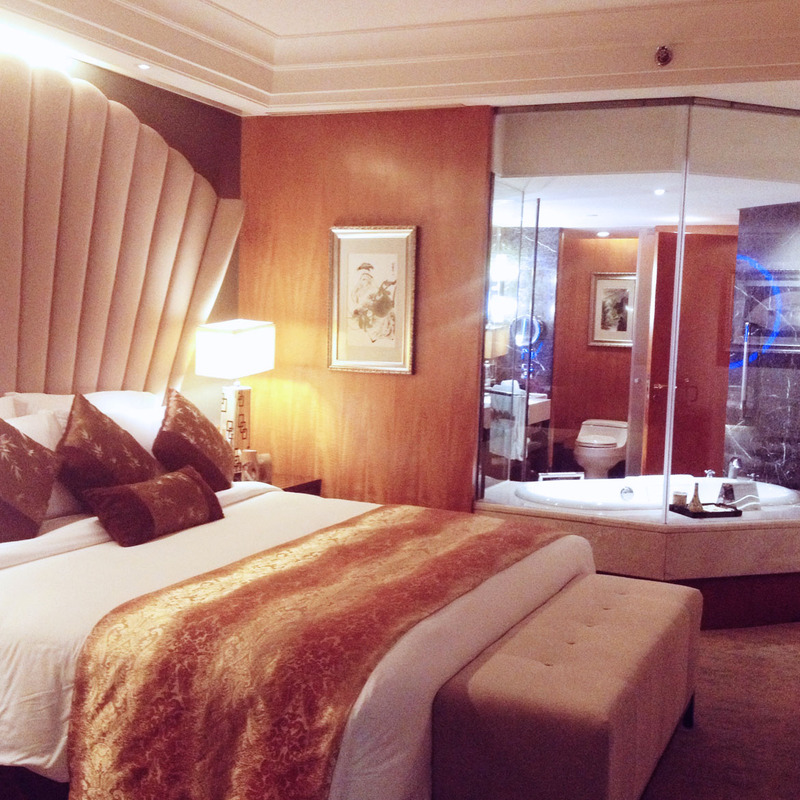 A rare attribute even in some of the five-star hotels in Shanghai. I got checked in quickly and zipped up to discover my room. Again, another delightful moment of truth. The room met my essential criteria: fresh, clean scent; smooth, clean bedsheets; a comfortable mattress and plentiful pillows; sufficient lights; large bathroom with a generous sized vanity for all my toiletries; and easy-to-reach electric outlets at the work desk (no more squirming under the table to get my devices charged up!). And it scored further points by having pretty little decorations such as brightly painted, Chinese-style porcelain bathroom accessories and ashtray, and a set of L’Occitane toiletries. When one’s environment is this lovely, restful sleep is almost guaranteed. And indeed, I was very well rested throughout my five nights in the city. I slept so well the first night that I found it surprisingly easy to rise early next morning for breakfast. And I hardly take breakfast on trips. 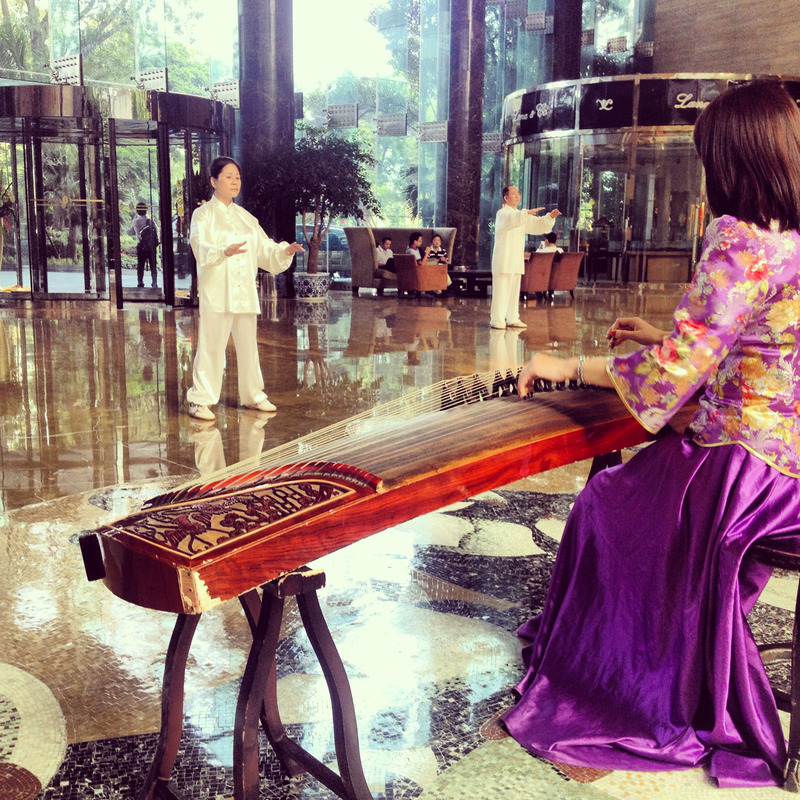 I was glad I made an exception on this trip because the hotel puts up a brief taichi demonstration along with the soothing melody of a guqin – a seven-string zither – in the lobby every morning. The breakfast area was such a delight too. It was served in the sprawling garden courtyard-style restaurant I saw the night before when I first arrived at the hotel, and it looked far more spectacular in daylight! Here’s the marketer’s shot of the courtyard restaurant, which does the venue far greater justice than the shot I took with my smartphone. And oh! 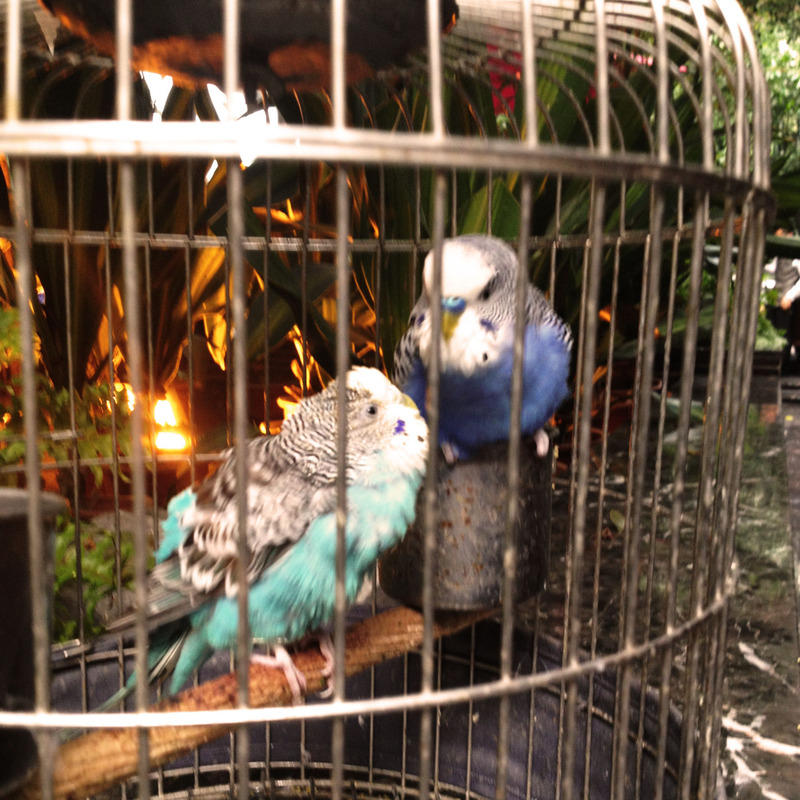 Little cages with twittering birds were placed around guests, mimicking the traditional Chinese man’s habit of bringing their feathered friends to breakfast. How lovely! Like most international branded, five-star hotels, the breakfast spread was mind-boggling. It is that mind-boggling variety that keeps me away from hotel breakfasts. My brain cannot function well in the morning and I find it quite a chore to have to choose what I eat, especially when most of the items are catered for Westerners. Fortunately, being in a hotel in a Chinese city meant that there was something traditional in the selection. My stomach leapt with joy at the sight of a bustling noodle soup station, where a cheerful lady chef tossed handfuls of egg noodles into a pit of boiling water then pulled them out within minutes and into large bowls. 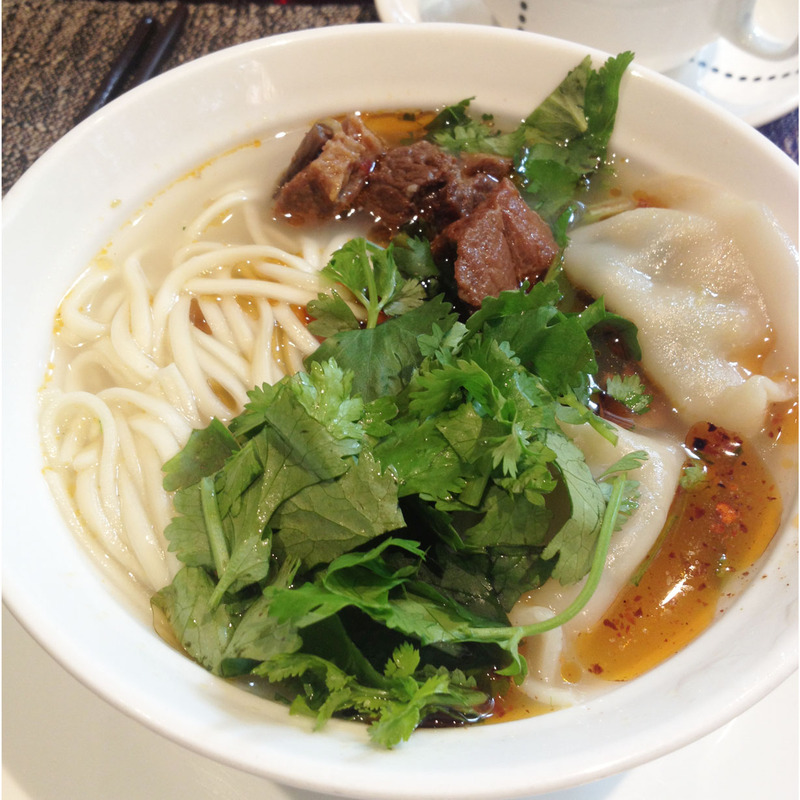 With Sichuan being the Chinese capital of spice, diners get to choose from a variety of local chilli pastes and oils to flavour their noodle soup. Yummy! I dressed my bowl with a generous amount of sesame oil and chilli oil, plopped in several plump boiled meat dumplings and braised beef, and topped it all off with a handful of fresh cilantro. 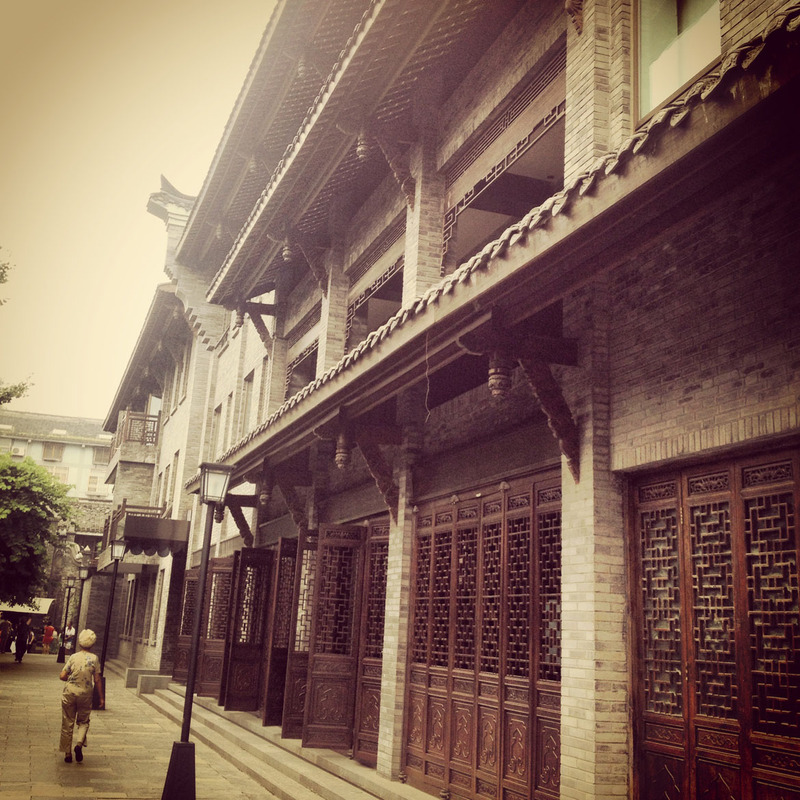 I truly enjoyed this hotel, and in a way, it was one of the reasons why I grew to love Chengdu so much. I’ll tell you more about the city in my next posts! For now, it is time to go to bed. Heavy, persistent rain battered China’s Sichuan province in July, resulting in the area’s worst floods in the last 50 years. The weather over Western China has improved since then, but continuous days of rain is still forecasted for the provincial capital city, Chengdu. I’m worried because I will be heading there in a week’s time, and the last thing I want is to be incapacitated by floods. A colleague there has warned that it gets quite cold – by tropical Singapore’s standards – whenever it rains. Gah. Wet and cold. I’ve checked: temperatures average at 15-23°C daily this week. I was tickled pink by a recent article by Qianjiang Evening News, a Chinese publication, which told of a group of Chinese passengers who pilfered 30 sets of stainless steel tableware onboard a Singapore Airlines flight. The English version can be found here on the South China Morning Post site. When the flight attendants demanded the return of those tableware, the Chinese passengers refused, claiming that relatives who had flown with the Singapore carrier had managed to keep the same items as souvenirs. So somewhere in China are people with sacred collections of Singapore Airlines tableware. I wonder if Singapore Airlines is secretly proud of having such determined fans. Anyway, the incident ended with the tour guide of the group reprimanding these light-fingered tourists, who eventually surrendered their loot . “Stop hurting the reputation of Chinese people,’’ the tour guide was reported to have said. The reputation argument is a most poignant one, as it was only recently that a message in Mandarin – “Ding Jinhao was here” – was found cut into a wall of the ancient Luxor Temple in Egypt. The vile graffiti was later traced to a 15-year-old Chinese boy. While my immediate reaction is to click my tongue in disapproval of these socially-backward, self-centred tourists from China, I must remember that the majority of these travellers are still ‘amateur’ tourists, new to the fine art of travelling with grace. Most travellers start off this way – bringing their behaviours from home to their holiday destination. The more they travel, they more they will learn social etiquette acceptable in an international society, and the better behaved they will be. Well, at least one could hope for such a progression! I’ve been reminded by older friends in the tourism trade that Singaporeans started out pretty much the same way too – pocketing airline cutlery and loose items from hotel rooms whenever possible, poking and squeezing fresh fruit at farmers markets to check for freshness, much to the chagrin of sellers who were left with bruised fruit that can no longer be sold. It took Singaporeans decades and several generations to become more graceful travellers, although there are still disgraceful ones, such as this young couple who caused damages totaling S$1,300 after staying at a Taiwanese homestay inn in June this year. China is huge, with many rural towns that are far removed from metropolitan city behaviour although the disposable income of its people is rising. 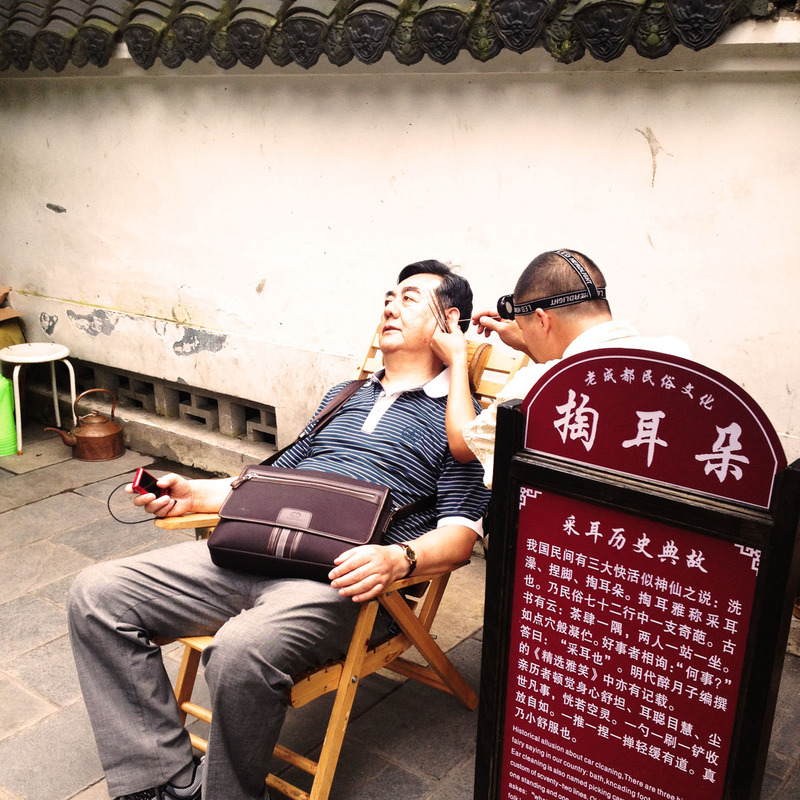 It may take the general Chinese population the same length of time to mature in their ways. Then again, with word that the Chinese government may implement social etiquette classes to guide their citizens on good behaviour while travelling overseas, destinations that are popular with the Chinese may get some relief sooner than expected.